Yirssi: Piece | Devious Maids: A Show That is Long Overdue. Originally published on Power Minority. While a lot has been written about Devious Maids, the new Lifetime show created by Marc Cherry (of Desperate Housewives fame) and executive produced by Eva Longoria (also of Desperate Housewives fame), I believe people are automatically jumping to the negative without giving the show a fair shot. 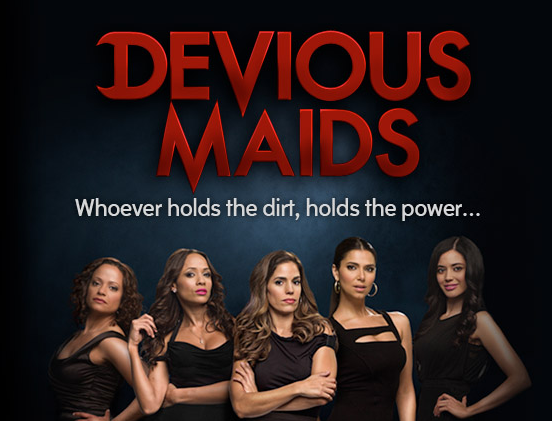 Devious Maids follows the lives of 5 Latinas who happen to work as (you guessed it) maids in Beverly Hills, California. Each woman has a different life story, and they are showcased in the soap opera style of Desperate Housewives. The main concern people have with this show is the fact that although it's breaking barriers by being the first all Latina primetime show on television, it is doing so by casting the women in a stereotypical role. Latin@s are also lawyers, and doctors, they say. So why keep pushing the maid angle? Why waste this opportunity on maids? I have one big issue with this complaint: it implies that maids stories are not worth telling. And yes, while Hispanic women have disproportionately been depicted as maids, they are always in the background. The story being told is the one of the employer, the person with enough money to have a maid. So it's been about time that the story of the maids themselves was told. I will focus on the story that touches me most, the story of Rosie. She is in this country working to provide for her son, who is still in Guadalajara. She is also trying to make enough money to retain a lawyer in order to bring her son to the U.S. This story particularly affects me because the story of my mother. Coincidentally my mother's name is also Rosy (Rosanny, but people call her Rosy). My mother, a Dominican immigrant, had to clean houses and hotels in order to make ends meet. She also had to leave me behind in the Dominican Republic because she couldn't take me with her when she moved to Spain. She came back two years later and took me to Spain with her, when she was able to bring me legally and make me a Spanish citizen. This happened 23 years ago, but it's still happening now. And when is that story ever told? When have you seen, in national media, the story of how immigrant women leave their children behind, and endure the heartbreak in order to provide for them and give them a better life? Sure, there was the movie Bajo La Misma Luna. But that wasn't mainstream. This is. The rest of the stories are different. Zoila and Valentina work for an emotionally unstable mother, and her son. We see how Zoila simply wants to be a good mother for Valentina, and steer her in the right direction. Carmen only took the job of maid to get close to Alejandro, a singer who could help her catapult her career. And it's very obvious (and showcased in a rather nasty manner) that Marisol is intelligent and educated. We later learn the only reason she took on the job of maid was to find out the truth behind a murder that has affected her family. It is also very obvious that not all of the women's ultimate goal is that of being a maid. Carmen and Marisol chose to do the job in order to gain information and opportunities that could change their lives. Being a maid is clearly not the last career stop for these women. Lastly, each woman is complex, as are their stories. Stories that, in my opinion, are very much worth telling. So yes, while I do wish that there was better and more accurate representation of Hispanic women in the media, and while this show is not without flaws, this show and these stories are actually long overdue. How about you? Have you seen Devious Maids? Do you think this show was a wasted opportunity, and if so, why?